Schools, employers, day care providers and other parties have a responsibility to provide a safe environment for employees, landlords, students and others. And the manufacturers of household and industrial chemicals have a responsibility to provide warnings, safe containers and other safeguards. If you have questions about your rights following injuries from toxic cleaners, metals or other hazardous substances, contact the personal injury attorneys of The Orlow Firm for a free initial consultation. Call (646) 647-3398 or contact us online. When you work with our firm, you will deal directly with a partner. We believe you should expect nothing less from your law firm. We can work with you, treating physicians and medical experts to determine the true cause and extent of injuries caused by toxic chemicals. We believe that you, your family and even your pets have a right to a safe environment and safe products. 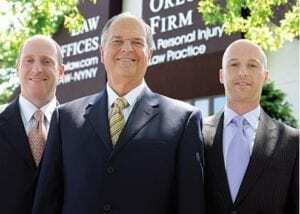 At The Orlow Firm, our lawyers truly care for each of our clients. We treat each case as the most important case we have, which helps us get you the results you deserve. Contact us for experienced personal injury legal representation. We offer free initial consultations and operate four offices across New York City for your convenience. We can go to you if you cannot come to us.